The use of light metal castings, particularly in the transport sector offers environmental advantages through savings of weight and ease of recycling. European light metal foundries are typically small or medium size enterprises, with a strong need of innovation for being competitive. The 4L-Alloys School is addressed to professionals coming from European producers and users of cast, rolled and extruded Al-based components, as well as from the whole supply chain. 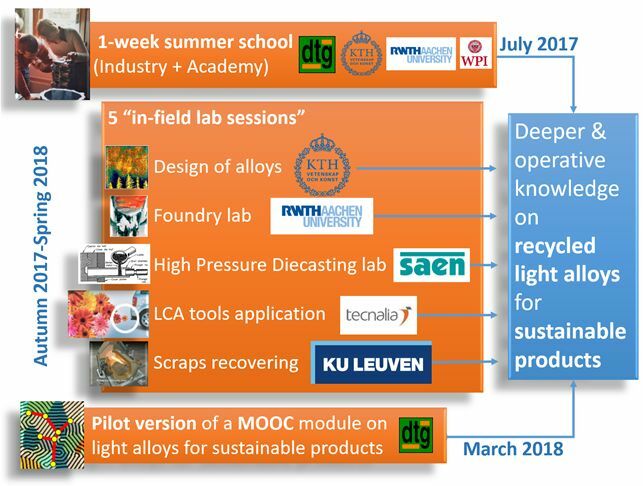 The 4L-Alloys School will train these professionals at improving the sustainability of high quality manufacturing of Al-based products, taking advantage from the potential of recycling and recycled alloys. The 4L-Alloys School, thanks to trainers from industrial companies, Academy, Technology Transfer Institutions, will offer an overview of this potential, merging topics which are important both for industrial engineers (knowledge of innovative solutions and approaches) and for researchers (knowledge of the industrial requirements to be targeted by innovation). The 4L-Alloys School will be held in Vicenza (24th-28th July 2017), and will be linked to 5 in-field lab sessions (scheduled from September 2017 to march 2018), allowing the opportunity of visiting plants and laboratories with special competence in areas such as alloys design, recycling, processing of recycled alloys, life cycle analyses.